Rancty binding wire factory sells binding wire products. 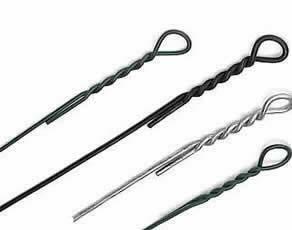 The range of our products are always available: binding wire, box wire, cotton bale tie wire, double loop wire tie, single loop bale ties, rebar tie wire, U type wire, PVC coated wire, etc. All the products that we offer to our clients, is strict control on quality. Our qualified staff will help with the selection of goods and give all necessary advice and guidance on the use of products. We can offer our clients a wide range of tie wire (annealed wire, galvanized wire, S.S wire, PVC wire, welding wire, copper wire) at the best prices. Careful attention to every clients. Cotton bale tie wire is also named quick link bale ties. Our Cotton bale tie wire is manufactured using high tensile wire. Quick link bale ties are for packaging all types of expanding fibrous material cotton, synthetic fiber, wool, waste, etc. It is Suitable for hand tying & automated systems. Galvanized wire can withstand the negative impact of the environment and increasing their service life. Galvanizing improves corrosion resistance wire and greatly expands its scope. And it has better aesthetic properties. Galvanized Wire used as tie wire, in the form of coil wire, spool wire or further processed into straightened cut wire or U type wire. We offer advantageous conditions of co-operation for regular customers. This means that you can get a preferential purchase of products or additional discounts. Learn and develop. Despite a wealth of experience, we are constantly exploring new range offered by manufacturers and possible areas of application. We are pleased to be included in the work to promote new types of tie wire. We are confident that we are ready to become a stable, reliable and profitable partner for your company. 1. Pre cut & looped for use with manual tie 'mill size' baling presses. 2. Rewound coils (40 kg) for use with fully automatic units. 3. Formers - up to 1 tonne in size, suitable for large volume users. Since the very beginning, this manufacturer has what you need to tie things up. From baling wire in all forms to galvanized, straight and cut, and steel strapping, we make and ship reliable, economical bale wire. We also make a respectable bale tie, including double and single loop bale ties. Binding wire used for binding reinforcement construction. It is made of mild steel inker, which takes place in the form of thermal processing annealing. Binding wire is also called "annealed wire." Binding wire without coating has a diameter of 0.16 mm - 10 mm, and coated from 0.2 mm to 6 mm. The most common use for tie wire diameter is 0.8 mm, 1 mm and 1.2 mm. Heat treatment, it will have high strength. Cover the wire with zinc, strengthen its resistance to corrosion and guarantee longevity. Galvanized has a matte or shiny finish, it is easy to oppose the negative effects of the environment. Heat treatment, it becomes softer. After the heat treatment, it used bright annealing in bell furnaces - it takes away the traces of metal oxide on the surface of the film. Cotton bale tie wire is also named quick link bale ties. Our Cotton bale tie wire is manufactured using high tensile wire. Quick link reduces your overall installed cost on your baling procedure with its quick link tying method. Material: Galvanized High Strength Steel Wire. Surface: Galvanized (hot-dip or electro) . Tensile Strength: 1400 - 1700 N/mm2 or as per client request. Breaking Load at loop: 975 to 1050kg mini. Package: within lengthwise bundles. Well wrapped & protected. 100pcs/Bundle, 22Tons/20ft container. Uses: Quick link bale ties for packaging all types of expanding fibrous material cotton, synthetic fiber, wool, waste, etc. It is suitable for hand tying & automated systems. Single Loop Bale Ties is also named cotton bale tie wire, loop wire tie or banding wire. Bale wire with single loop processing with low carbon steel wire, through drawing and electric galvanizing. Single Loop Bale Ties are good product for hand-tie applications. It is easy to feed, bend and tie off your material. And it can speeds up your processing time. Material: High Quality Galvanized or Black Annealed wire. Wire Gauge: 2.00 to 4.50mm. Standard Length: 3 to 8m. Industrial floor mats include rubber mats and matting, modular floor mat systems, and other matting for traction, impact protection, worker ergonomics and comfort, and can include functional features such as ESD protection.